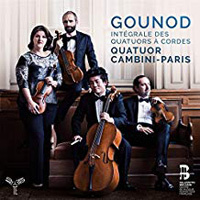 CHARLES GOUNOD (1818-1893): String Quartets in C “Petit quatuor”, CG.561, in A, CG.562, in F, CG.563, in A Minor, CG.564 and in G Minor, CG.565 (First Recordings on Period Instruments). Description: All Gounod's quartets are late works (after 1881) although none can be dated with any certainty. The C major work, due to its subtitle, may have been the composer's first attempt: its tormented slow introduction which returns at the end of the work, redolent of Franck, its slow movement, so like a late Beethoven canzonetta, its Mendelssohnian scherzo and tarantella finale bespeak a composer experimenting with pure music after a long career spent writing vocal music. The quartets in A and in F were only discovered in December of 1993 when they turned up at an auction of Gounod's manuscripts. Whatever their order, all five are not works written by a "slumming" opera composer; they are pure chamber music written by a master at the height of his powers. 2 CDs. Quatuor Cambini-Paris.